A case of the nerves is normal when students give class presentations. Nico Aguilar did that one better when he was a University of Iowa student. Nico Aguilar and Anthony Pham. Photo by Tim Schoon. But from that disaster came something valuable. 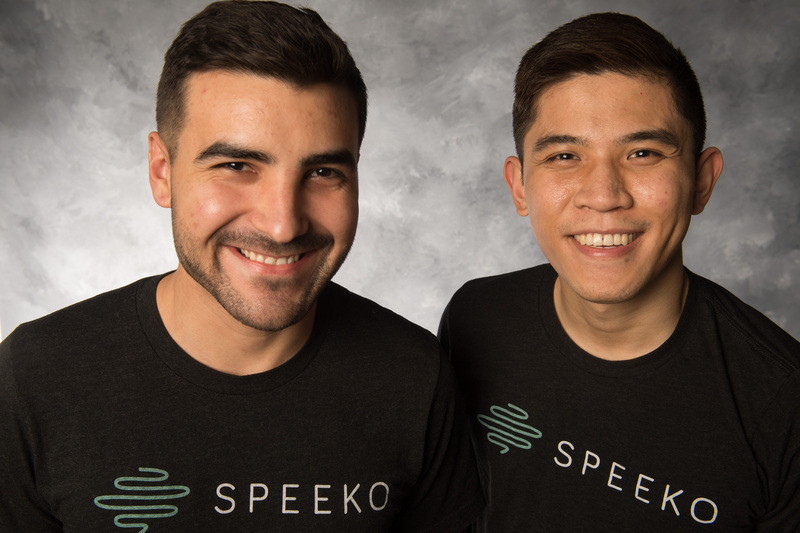 It helped Aguilar and current UI student Anthony Pham form the idea for Speeko, a voice analytics company that uses artificial intelligence to help people avoid embarrassing public speaking experiences by measuring and improving their verbal communication skills. As a team, the two have pitched their way to start-up success at a number of university and international entrepreneurial competitions. Speeko’s team of developers and data scientists built machine-learning algorithms to identify the vocal patterns of both superior and poor communicators. The algorithms are based on thousands of speech recordings and are grounded in years of academic research on effective communication practices. Speeko is available through a mobile app, where users record themselves and get instant feedback on characteristics such as pace, pausing, intonation, and eloquence. The app flags weak spots and also provides lessons on how to improve. It might tell the user to stop using filler words such as “like” and “y’know,” or to reduce uptalk at the end of a sentence. That makes it as much a coach as a critic. “Speaking to other people is such an important part of our lives, but so few of us get any feedback about it,” says Aguilar, who used a speech coach after his rhetoric class meltdown, an experience that inspired the Speeko algorithm. Aguilar met Pham, who is from Davenport, Iowa, in class when they were undergraduate physiology majors at UI, and both graduated with Bachelor of Science degrees in 2011. They became friends while working on group projects and later collaborated on other start-up ventures while contributing to a National Institutes of Health-funded research project that measured communication patterns in medical settings. Both were graduate students at the time, studying in the College of Public Health. Aguilar received his Master’s in Public Health (MPH) and Master in Health Administration in 2014, whereas Pham is expected to graduate with an MPH in 2019. Pham also received his MD from the Roy J. and Lucille A. Carver College of Medicine in 2016. Self-described technology junkies, the pair were avid users of mobile apps that help people improve a variety of skills, from learning new languages to tracking exercise to meditating—products that “are like having a coach in your pocket,” says Pham, who’s also struggled with public speaking. “We were seeing this happen in other industries, and we thought, ‘Why aren’t we leveraging the incredible advances in technology to improve communication coaching?’” says Pham. Merging these experiences and ideas, Pham and Aguilar worked on Speeko nights and weekends while pursuing their respective graduate studies. They connected with the UI John Pappajohn Entrepreneurial Center (JPEC) and participated in numerous events, winning the Rose Francis Elevator Pitch Competition and JPEC Business Model Competition in 2017. The latter propelled them to the 2018 International Business Model Competition, where they were semifinalists. Most recently, the Speeko team was selected by Techstars, a global start-up accelerator, to be part of its 2018 Chicago cohort. Only 10 companies from more than 2,200 applications were chosen for the three-month program that ran from July through October 2018. Techstars provided the teams with workspace and direct access to a mentor network of Midwest tech investors, executives, and founders. The Speeko app went on sale in the Apple iOS App Store in fall 2018 for a monthly subscription. It already has at least one happy customer, Obi Omile, an entrepreneur who is part of Techstars. Omile downloaded the app in September, all the while thinking his public speaking skills were adequate and that he didn’t need help from an algorithm. He decided to give it a try anyway, to see how it worked. “After I started playing around with it, I found it very useful,” he says. He realized he talked too fast when he gave presentations, and his words ran together. Speeko’s digital lessons and skill games helped him not only identify his trouble areas, but also fix them. “It especially helped to improve my diction, enunciation, and intonation by isolating those parts of my speech so I can work to improve them,” Omile says. It’s already paid off with improved presentations to potential investors in his business, he says. Speeko is currently co-headquartered in two cities. While Aguilar is now based in Chicago and works full-time on Speeko, Pham is finishing both his Master of Public Health degree in occupational and environmental health and his medical residency training at the UI Hospitals & Clinics. The pair also encourages aspiring UI entrepreneurs to take advantage of the vast resources offered by the university. Deb Venzke contributed to this story.